Want to turn your audience from casual readers into loyal customers? Ready to start consistently selling your own stuff instead of relying on ads? This week, I’m on the line with none other than Yaro Starak, author of the Blog Profits Blueprint and founder of Entrepreneur’s Journey, a blog dedicated to helping entrepreneurs start a blog, grow an email newsletter, and make money selling digital products. Yaro has been blogging for over ten years and is actually the person that taught me how to blog. 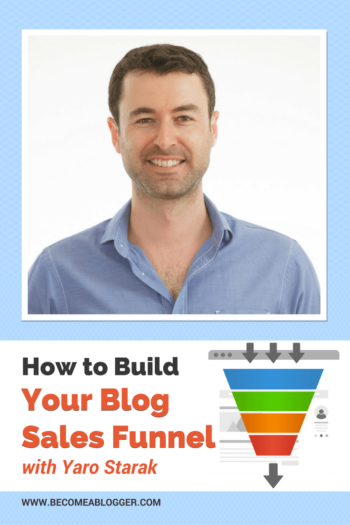 He’s one of the two guys that started Become a Blogger and is an expert at building blog sales funnels combining the power of email marketing and digital products in a way that makes money over and over and over. Way back in 1998, Yaro got a dial-up connection for his university studies, and he fell in love with the internet. 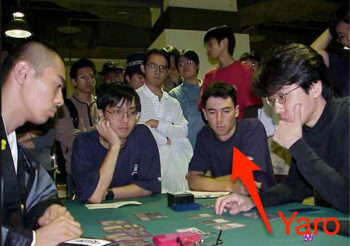 At the time, he was really into a card game called Magic: The Gathering, and built a basic GeoCities site based around the game. That site turned into his first online business. Yaro says that he was aware of the potential to build a business online, and he never wanted “full-time employment” anyway. He says that he was sort of in the right place at the right time: he and the internet reached their “teenage years” together. At the time, there were no video tutorials, no WordPress, no social media. Nobody was really buying ads yet. He constructed the whole site in flat html. This site earned $500 to $1,000 per month at its peak. That income came from banner ads, newsletter ads, and buying and selling cards for the game. The site also gave Yaro his first experience of credit card fraud! Around the time that he graduated from university, Yaro had lost interest in playing Magic: The Gathering, and he was feeling like he wanted to do something else. He sold that site for $13,500. At the time, he also had another online business called BetterEdit.com, which was like “the eBay of editing.” The site connected students who didn’t have English as their first language with professors and graduate students who could help them edit their papers. Yaro sold this site in 2007, but it was because of this business that he started blogging. Around 2004, Yaro started seeing that blogging was a great way to get free traffic from Google. So he attempted to blog about essay editing for BetterEdit.com. He didn’t know much about editing, and so he found himself writing more and more about the entrepreneurial side of things. Yaro really enjoyed this kind of writing, so he registered entrepreneurs-journey.com in 2005. He didn’t think that this site would become his livelihood at the time. He felt that he was just telling stories about his journey as an entrepreneur. 2005 was the dawn of social media, so Entrepreneurs Journey didn’t have an email list at first. It was all about RSS feeds at the time. But Yaro also felt that he had to understand what the email list was for before he could start one. What content goes where? Finally, he realized that the email list is more “laser-targeted, sequential content with a core outcome,” whereas with a blog you can “bounce around a bit more with your ideas and subject matter.” Once he added the opt-in on the blog, he was getting 5 to 10 subscribers per day. Selling your own stuff is better because of the strong relationship people have with you. At first, Yaro was making most of his income through ads and affiliate sales. But you need a product of your own to really make money. Yaro had seen friends do product launches, and doing a launch seemed to really make a big difference to the growth of their businesses. It felt like a “low-hanging fruit” opportunity. He had about 3,000 email subscribers, and as many people subscribing to the blog at the time, so there was a ready-made audience to launch to. After launching a monthly subscription service, Yaro eventually transitioned to a 6-month program, which is the first product that I bought from him! He says that selling your own stuff is so much better than relying on ads and affiliate sales because of the strong relationship people have with you. They’re much more likely to buy your stuff than an affiliate recommendation. Plus, $47 per month from even 100 people is much better than $100 per month from 4 or 5 ads. Yaro had already created two flagship courses by the time he met Gideon Shalwick. We covered the story of how becomeablogger.com came to be in episode 273, so go to becomeablogger.com/273 to hear all about it. 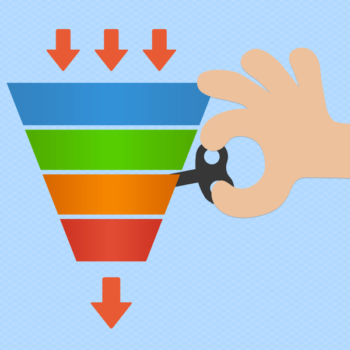 Why Build a Sales Funnel? Yaro was making a ton of money just launching and re-launching his flagship courses. Around 2012, however, he needed to close down some of those courses because they were dated. He had a chance to rebuild his business and create some new products. A sales funnel was his next step. The core idea of a sales funnel is that it’s easier to sell your highest-priced products to people who are already your customers. So you build in lower-priced products and upsells along with email sequences in order to entice people to buy. 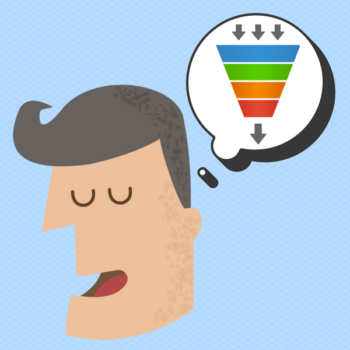 So why do a sales funnel, especially if you’re already making money? Launches are a lot of work. Yaro didn’t want his long-term business plan to rely on always needing to come up with a new and creative way to launch his products. 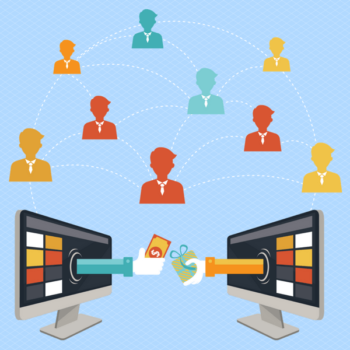 Launches also rely on asking friends for promotions, and returning the favor when they launch their products. Yaro wanted a steadier income that wasn’t based on advertising and affiliate sales. With launches, you make a bunch of money all at once, but you don’t have the same kind of income month-to-month. And if a launch fails, you could be in real trouble. Yaro has built his sales funnel over the past few years. Once he had taken down his older courses, he was down to $1,000 to $2,000 per month in income. Now, he’s earning $20,000 to $30,000 per month just through his sales funnel. What can I potentially give them? How do I take those needs and turn them into a product funnel? Keep in mind that you can re-purpose existing content in creating your products. For example, your ebook might be made up of existing blog posts that you’ve put together. You can also sell audio content if you have a popular podcast. Yaro had paid podcast interviews club that he used to sell. For your sales funnel, lay out a sequence of information that can run on autopilot. You want to map out the products you want to sell and how you want to sell them. The implementation will take time and hard work. Yaro’s plan took about 3 years to actually be completed. Take it one step at a time. You can set up a sales funnel for anything you’re selling. The key is to lay out a sequence of information that can run on autopilot. Autoresponders make this possible. Once you have a plan mapped out, the next step is to stop using broadcast messages or one-off newsletters and switch to at least a two-week sequence of emails that are strategically designed to sell your products. All of the normal rules of sales apply. So you need to have case studies, or stories of your product working for people, lined up. You need to know the problem well enough that you can really speak to people’s needs. And you need to present people with a clear solution to the problem. This tells people that the thing you’re offering will go away if they don’t buy it right now. You can use this with prices, actual products, or bonus offers. Yaro likes to use this on his lower-priced products. For example, he offers his $49 ebook for $29 as part of a free email course. With this one, you’re demonstrating that your product works because other people are seeing results. This is where your case studies and testimonials come in. This shows potential customers that you know something about the problem. Sometimes, this can be because you’ve spent a lot of time researching something, or because you have a qualification. Sometimes you get authority by association, which is why people will share photos with celebrities. It’s all about establishing trust. The simplest version of a sales funnel is this two-week email sequence. This is how Yaro sells his ebooks. You start with an opt-in to a free email course. 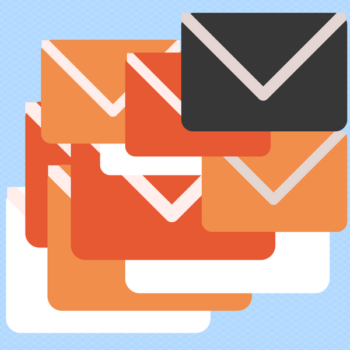 Once someone is signed up, they’ll receive 6 to 10 emails over the course of two weeks. Yaro’s emails give subscribers links to blog posts, which contain the teaching content. In the first week, you’re focused on education and introducing your product. The first email should explain the problem and tell your story. In the second email, you want to give them some how-to info and start teaching them. You should also introduce the product at full price in this second email. In the second week, you’re still giving case studies and teaching. But the key focus is on emphasizing a limited-time offer. This is where you introduce scarcity. In every email in the second week, you reiterate that the offer is for a limited time only. The last email warns subscribers that they only have 12 or 24 hours left to take advantage of the special offer. The key is to make this process evergreen. Someone should be able to search at any time, find your opt-in, and go through this whole process without you being involved at all. The machine should run on its own once you create the content. Once your simple funnel is set up, the next steps might be upsells or additional email sequences offering higher-priced products. You can build out from your simple sales funnel pretty easily. For example, Yaro prices his ebooks at $49, and sells them at $29 through his email course. His ebook purchases also come with a one month free trial of his membership site, which can turn a one-time $29 purchase into a recurring $40 purchase. Remember that the idea is to get people in the door with lower-priced products. People need a lot of exposure to you and to your teaching in order to justify a $1,000 purchase. You can also use a sales funnel just to get people to access content. If you’re just starting out and you’ve got a 90-minute webinar, you can use the funnel just to get people into the webinar. You give it away for free, but it gives you the chance to build some trust to get them to the paid products. Yaro also talked about a tactic that’s popular right now called a “tripwire.” It’s basically a post opt-in offer. So if someone opts in to your free email course, they’ll immediately be offered a $19 manual or short ebook. If they say yes, then they’re a customer! If they say no, they’ll still get funneled through the email course, and they may make a purchase later on. The goal is to graduate people from casual readers of your blog, to subscribers, to customers, to loyal customers who are willing to spend $1,000 per year or more with your blog. If you have a $100,000 business, Yaro says, that’s most likely coming from the hundred people who are willing to spend at least $1,000 per year with you.What’s Next? If you want to go deeper and learn more about building your sales funnel, head on over to platformlaunchplan.com. Yaro has just launched a webinar funnel, and if you sign up you’ll have to opportunity to learn the process by experiencing it. Plus, the content is about selling through your blog, which is exactly what you want to do! How to Start a Movement with Your Blog – with Gideon Shalwick – an interview with Gideon where we also mentioned how he and Yaro started Become a Blogger together. platformlaunchplan.com – A webinar recently launched by Yaro to where he teaches how to build your sales funnel. This DOES sound complicated… but amazing at the same time! Great interview!